Harvest Festivals: All of the best things come together at harvest festivals: fresh food, great friends, fall weather, and live music. 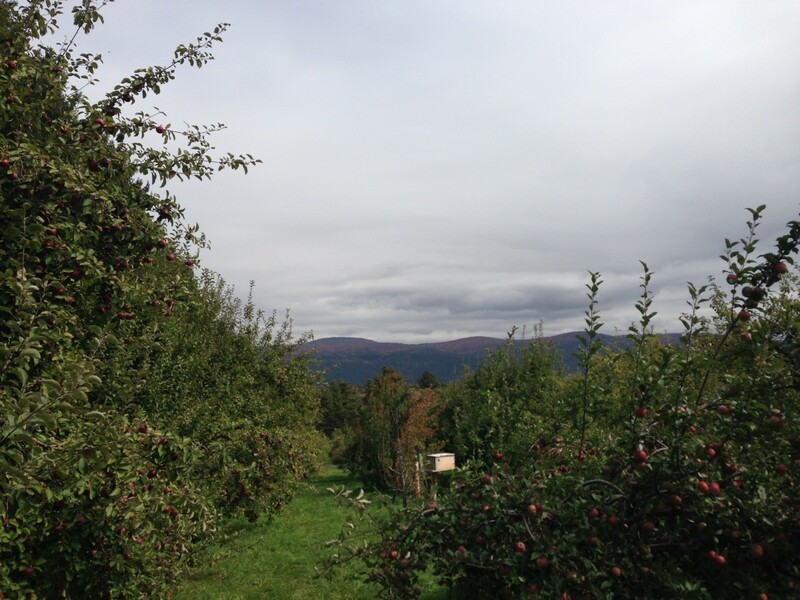 Whether at Middlebury’s very own Organic Farm, the town co-op, or Shelburne Farms, you’re sure to leave with a full stomach and a replenished soul. Walk/jog/run in and around Middlebury: Take the foot bridge for a fantastic view of the Otter Creek Falls, saunter in an out of local shops, and get to know this picturesque New England town in a personal way. For a more extensive adventure, discover the Trail Around Middlebury (“the TAM”) for eighteen miles of fun. 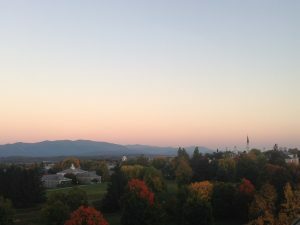 See the views from above: For an iconic view of fertile Addison County overlooking Lake Champlain and the Adirondack Mountains, check out Snake Mountain. 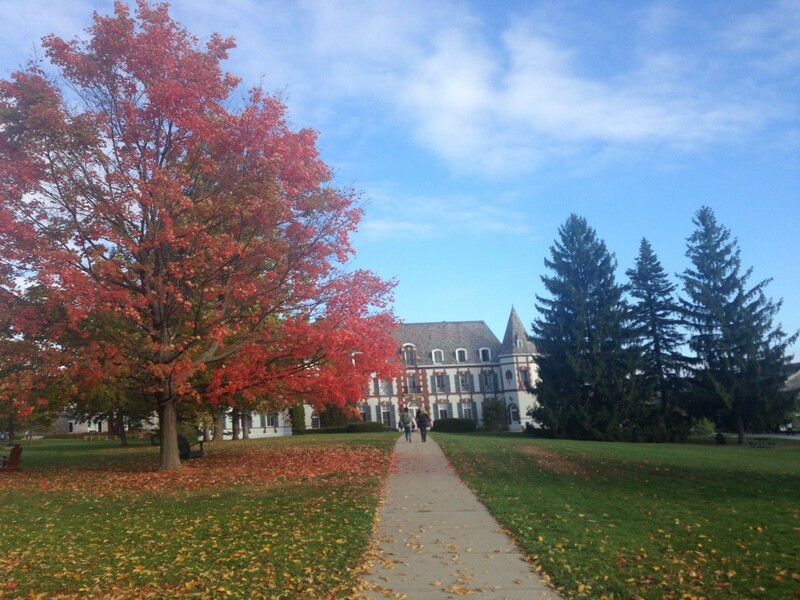 In less than an hour, you can experience an unparalleled view of fall foliage. If you hate hiking, fear not! You can get permission to take the elevator up to the roof of McCardell Bicentennial Hall (our science center) for a 360 degrees view of campus. I took my grandparents on the roof of Bi Hall and they loved it! Fall Family Weekend: Whether you have family visiting or not, Fall Family Weekend is the perfect time to take advantage of fabulous fall activities. Take the free shuttle to the Middlebury College Snow Bowl (our very own ski mountain!) and ride the chairlift to see the foliage from up above. Swim: Yes, the water is freezing, but the thrill is so worth it. Some of my favorite bodies of water for swimming are Dog Team, The Middlebury Gorge, Bristol Falls, Falls of Lana, Silver Lake, Lake Dunmore and, if you’re up for the trek, Warren Falls. Class Outside: Convince your professors to have a class outside. 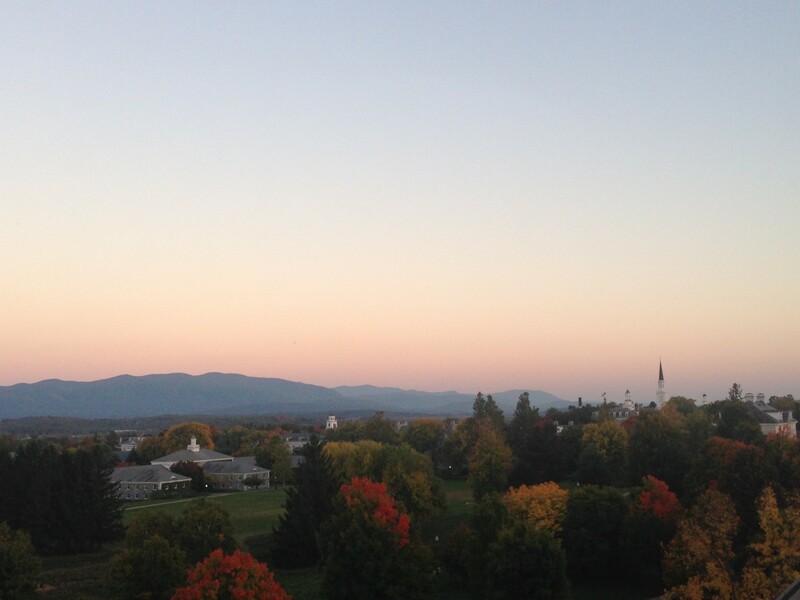 Get the best parts of Middlebury all in one moment by engaging in thought-provoking conversations while enjoying the natural beauty that surrounds you. Homecoming: There’s nothing like seeing friends who have graduated back on campus. The Midd spirit abounds, whether over meals in the dining halls or over cheers at athletic events. Eat a maple creemee: Try Vermont’s version of soft serve ice cream in its best form before the weather gets too cold. Rainbow sprinkles are a must. Picnic: Grab a to-go box from Proctor and head to the Organic Farm for a sunset dinner. Or, if you’re feeling adventurous, drive to Champlain Bridge on the Vermont/New York border for what’s guaranteed to be a magical sunset moment. There’s no better way to start off senior year than a dinner by the lake with friends! This entry was posted in Uncategorized on October 3, 2016 by Abigail Spector.